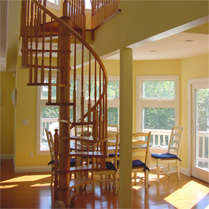 Ravenwood Stairways is located on Canada’s East Coast in beautiful Prince Edward Island. In an area of the world where heritage and tradition are still held in the heart, generations of woodworkers, boat builders and carvers have passed their craft on, giving the area many skilled craftsmen who hold great respect for their profession. 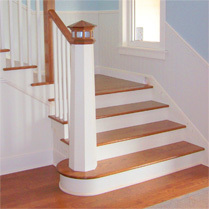 We have been in the business of beautiful staircases since 1989. Offering installations in Prince Edward Island, Moncton New Brunswick, and abroad. Our Silent Stair System is achieved by using a housed stringer system to lock our treads, risers and skirts together to eliminate the chance of movement assuring squeak-free staircase. 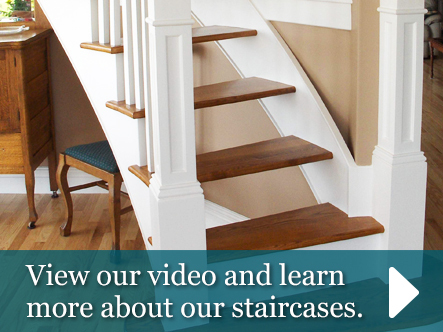 Consider the advantages of having a spiral stairway in your home! They are space-saving, attractive and give you quick access to areas that were not accessible before.